This original painting was done with acrylic paints and has a high gloss varnish on it. In December Jews and Christians are celebrating God’s light to the world. We are both seeking the coming of the Messiah (Ha Mashiach). Anti-Semitism separated the early church from its Jewish roots a long time ago. Many Jews and Christians don’t realize that Jesus was a Jew and raised in a Jewish home. His Hebrew name is Yeshua, which means rescuer or deliverer. Jesus never came to abolish the Law, or holy teachings, but to fulfill the Torah and write it’s teachings on our hearts (Mt. 5: 17). Christ was not Jesus last name. It was his title in Greek, meaning Messiah, or Anointed One. In Hebrew they called him Yeshua Ha Mashiach, Jesus the Messiah. 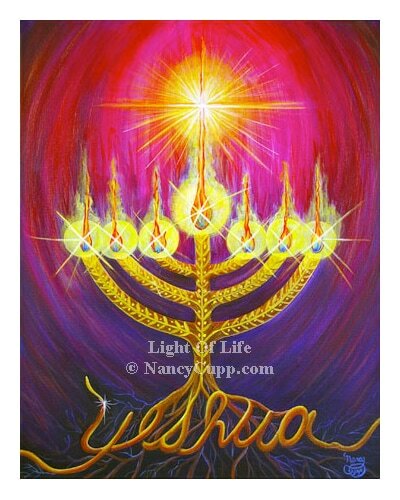 The only light in the Jewish Temple came from the holy menorah, which was lit each evening and cleaned and renewed with a fresh wick and pure olive oil each morning by the priest. The menorah of the temple was made from pure, hammered gold. It had seven candles. The number seven represents God, perfection, and completion. The candles represent the seven attributes of the Holy Spirit. The olive oil represents the Holy Spirit. Hanukkah is called the festival of lights or more correctly, the Feast of Dedication. In 165 B.C. they rededicated the Temple after revolting against Antiochus IV Epiphanes, who had set up a statue of Zeus with his own face on it and sacrificed pigs in the temple. They only found enough holy oil to last one day, yet it lasted 8 days. Did you know that Jesus celebrated Hanukkah?